Wild Willie’s Beard Elixir is a beard care product by Wild Willie. Wild Willie is a brand by The Manskape Companies foundation that produces various goods for men’s facial hair care like beard washes and mustache wax. Wild Willie’s Beard Elixir is beard oil and conditioner that enhances beard growth. It is available in two sizes and two colors: Unscented and Cool Mint. The difference is limited to the scents as Unscented carries the original odor of the oil, while Cool Mint has a minty touch to it. 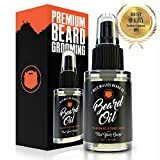 This review is about Wild Willie’s Original Scent Beard Elixir that has a 4.4 rating on Amazon and its 2-ounce bottle is priced at $14.00. Wild Willie’s Beard Elixir carries a unique packaging design. It comes in a plastic bottle with a top pump design. It is a rare design in the market when considering beard oils, which usually carry a dropper design or restrictor valve. The design is more related to pre-shave oils. Moreover, the bottle of oil comes in a clear form unlike other beard oil brands, which pack their oils in an amber colored bottle. The Elixir inside the bottle is a blend of ten powerful carrier oils, vitamins and essential oils for improving beard growth. These oils are apricot kernel oil, argan oil, castor oil, cedarwood oil, emu oil, gold jojoba oil, grapeseed oil, rosemary oil, tea tree oil and one of the most reserved components for high-end beard products, vitamin E oil. These components are all organic and nutrient rich, and they have their own benefits for facial hair, treating the beard from the inside out. With amazing contents in the right concentrations, it makes the beard smooth and easier to style. The elixir is exceptional for skin and soothes the irritation caused by the beard. For instance, jojoba oil and argan oil improves the skin beneath the beard, nourishing it with ample hydration that leads to softer and tamer beards. Emu oil is one of the rare additions in its contents which are not found in other beard oils. Emu oil carries anti-aging effects and has other general hair benefits, so if someone does not have a problem with the fact that an emu was slaughtered to get this oil, it is an exceptional elixir for beard fanatics. This Beard Elixir is one of the finest beard oils in the market. Moreover, it is the only ‘nut-free’ oil in the market with argan oil, which makes it suitable for people with nut allergies. The top pump design of the bottle is highly welcoming since it allows the user to get a pre-measured amount of oil with the right consistency each time they apply the elixir. However, the clear bottle reduces the shelf life of the product compared to other beard oils since harmful UV rays are able to penetrate easily through a clear bottle compared to an amber one. UV rays decrease the integrity of oils over time and the smell can be nauseating once the elixir disintegrates due to the UV rays, but regular users do not need to worry since it is still one of the most valuable beard oils in the market. Excellent Beard Oil, produces fantastic results and keeps your beard moisturized all day long. Highly recommend this to any man looking for a top tier beard oil.